November is Prematurity Awareness Month and November 17 is World Prematurity Day. 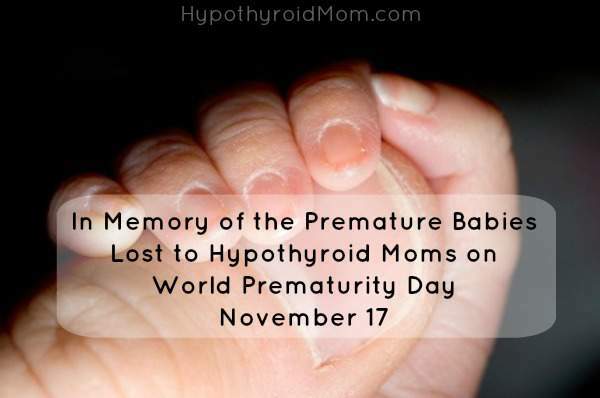 This post is written in memory of all the preemie babies lost to hypothyroid moms across the globe. 3:00 AM I feel a sharp pain…drift back to sleep. 5:00AM Another sharp pain…am I in labor? Can’t be I’m due in 5 weeks. 7:00AM I run to the toilet and blood gushes out. This can’t be happening. According to the March of Dimes, 15 million babies are born too soon around the world and more than 1 million of these babies die every year. I wonder how many of these babies are born to hypothyroid moms? I fear there are many more than the world realizes. It is not surprising that a relationship exists between preterm delivery and hypothyroidism/autoimmune thyroid disease given the research over the last two decades demonstrating a deleterious impact of thyroid abnormalities on pregnancy outcome. An increased incidence of first- and second-trimester miscarriage has been documented in women with both overt and subclinical hypothyroidism. Given this literature, the occurrence of preterm delivery in women with hypothyroidism (either overt or subclinical) could be argued to be one further manifestation of the impact of hypothyroidism on the maintenance of pregnancy to term. Antithyroid peroxidase antibodies are present in 6% of the general obstetric population and are associated with a threefold increase in the rate of placental abruption. 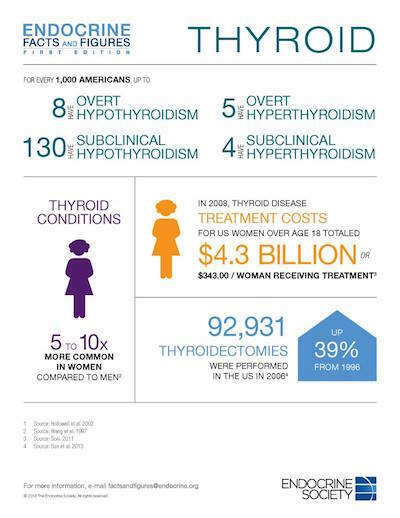 The study of subclinical hypothyroidism, conducted at Parkland Health and Hospital System in Dallas, compared pregnancy outcomes in 436 women with subclinical hypothyroidism with outcomes in 15,689 women with normal TSH levels. The study found a prevalence of maternal subclinical hypothyroidism of 2.2-2.5%. There were increases in the relative risk of placental abruption, preterm birth, neonatal intensive care admission and neonatal respiratory distress syndrome in the group with subclinical hypothyroidism, compared with euthryoid women. Maternal hypothyroxinemia was associated with a 2.5-fold increased risk of premature delivery, a 3.4-fold increased risk of spontaneous premature delivery, and a 3.6-fold increased risk of very premature delivery (<34 weeks). TPOAb positivity was associated with a 1.7-fold increased risk of premature delivery, a 2.1-fold increased risk of spontaneous premature delivery, and a 2.5-fold increased risk of very premature delivery. Maternal hypothyroxinemia and TPOAb positivity are associated with an increased risk of premature delivery. The increased risk in TPOAb positive women seems to be independent of thyroid function. Does the world have any idea what is happening to the babies of mothers with thyroid disease? Thyroid disorders affect 750 million people worldwide by recent World Health Organization (WHO) estimates, being possibly even more prevalent than diabetes. According to the Endocrine Society, thyroid conditions are 5 to 10 times more common in women compared to men. An estimated 20 million Americans have some form of thyroid disease but 40 to 60 percent of them are unaware of their condition. Consider all the women with thyroid disease, both diagnosed and undiagnosed, around the world who have no idea their thyroid could endanger their child. My son was born at 35 weeks. He weighed 5 pounds 11 ounces. With one million premature babies dying each year, I know how lucky I am that he is alive and healthy today. For several years I had dreams of a book to protect the babies of mothers with thyroid disease. I had vivid dreams of interviews I was having with thyroid, fertility, and pregnancy experts around the world to create a book that would help women with all types of thyroid disease (hypothyroidism, Hashimoto’s, hyperthyroidism, Graves’ disease, no thyroid, thyroid nodules, goiter, thyroid cancer) have miracle babies. I don’t believe those dreams were a coincidence. Saving babies of women with thyroid disease has become my life’s mission. There is currently NO universal thyroid screening of pregnant women despite the countless number of studies showing that maternal thyroid disease increases the risk of infertility, miscarriage, stillbirth, premature birth, pre-eclampsia, maternal anemia, babies with ADHD and autism. There are countless babies unnecessarily harmed and nothing is being done to protect them. I took a leap of faith and wrote a book Your Health Pregnancy with Thyroid Disease: A Guide to Fertility, Pregnancy and Postpartum Wellness with my thyroid hero Mary Shomon. Part 3 of our book provides comprehensive checklists of lab tests, optimal ranges, thyroid medications, prenatal vitamins, supplements, dietary changes, and more so that every one of our readers will know far more about making babies with thyroid disease than even their own doctors. 1. Alex Stagnaro-Green. Maternal Thyroid Disease and Preterm Delivery. The Journal of Clinical Endocrinology & Metabolism 2009; 94(1):21-25. 2. Abbassi-Ghanavati, M., Casey, B.M., Spong, C.Y., McIntire, D.D., Halvorson, L.M., Cunningham, G.F. Pregnancy Outcomes in Women with Thyroid Peroxidase Antibodies. Obstetrics & Gynecology 2010; 116(2):381-386. 3. Sullivan, M.G. American Thyroid Association statement: ID Subclinical Hypothyroidism Before Conception. Ob.Gyn.News Online 2004; 39(9):1-4. 4. Korevaar, T.I., Schalekamp-Timmermans, S., De Rijke, Y.B., Visser, W.E., Visser, W., de Muinck Keizer-Schrama, S.M., Hofman, A., Ross, H.A., Hooijkaas, H., Tiemeier, H., Bongers-Schokking, J.J., Jaddoe, V.W., Visser, T.J., Steegers, E.A., Medici, M., Peeters, R.P. Hypothyroxinemia and TPO-Antibody Positivity Are Risk Factors for Premature Delivery: The Generation R Study. Journal of Clinical Endocrinology & Metabolism Nov 2013; 98(11):4382-90.